This recipe was developed from an old Dutch Oven Sour Dough Biscuit recipe. 3 table spoons of raw sugar. Place flour, salt, sugar, in to a mixing bowl and mix. Next add the oil and cut in till you have pea sized lumps. Next add the sour dough starter and gently mix till dough is even consistency. 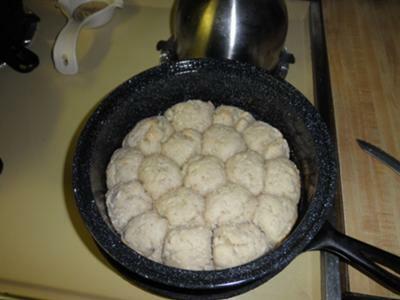 Take golf ball sized pieces of dough and round them into balls and place them into an oiled pan. Cover and let proof for one hour. One half hour if you added baking powder. Then place into your pre-heated solar oven and bake for one hour. Serve hot with dinner. Great with soups, stews, beans or even by themselves. I have even used this recipe to make a delicious old west style peach cobbler. Just place a bed of dough in the bottom of a round pan and pour in two 16 ounce cans of peaches with their juice. Add a little cinnamon and nutmeg to taste. Place the remaining dough over the top and bake in the solar oven for an hour and fifteen minutes or until signs of a crispy crust and boiling fruit. Great served with a little almond milk poured over it in a bowl. Thank you very much for this excellent solar cooking recipe, I am anxious to try it myself. I am glad to see the variety of recipes that come from our site visitors and customers. This should be a great inspiration for others who love to solar cook.